Dave and I have been enjoying delicious food and friendship with our Dinner Club for many years. The four couples meet every 2 to 4 months for a dinner which the host plans. They then assign the other 3 couples one recipe to make. This past weekend our assigned recipe was one the host experienced at a cooking class in Bay City, Michigan at Fusion 1 Café. 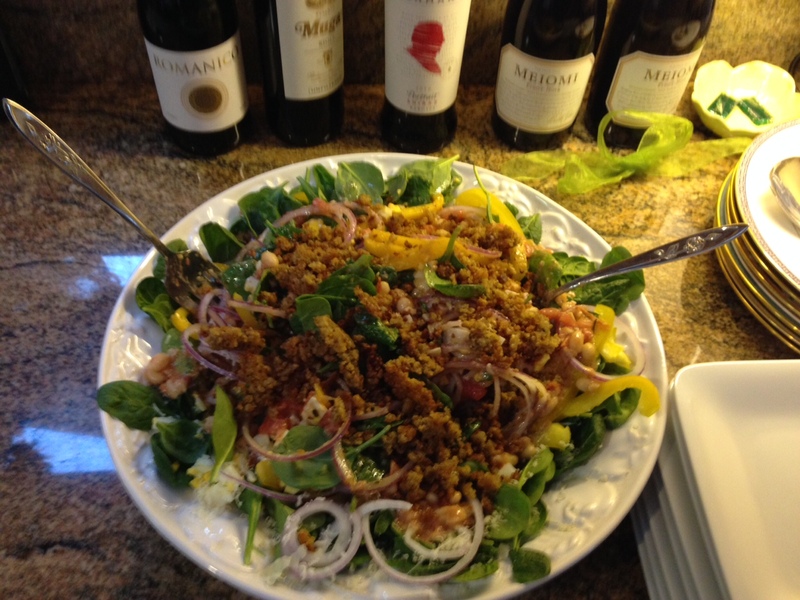 This spinach salad is reminiscent of the 1970s version which includes red onion, chopped egg, bacon pieces and a red wine vinaigrette. The Fusion 1 Café recipe goes beyond this, adding northern beans to the dressing. Bacon is substituted with a crumbly mix of toasted whole grain bread crumbs and parmesan cheese. I used a very hearty whole grain bread which is my favorite choice Kroger Private Selections Artisian Multi- Grain Boule. This is a hearty salad which can be a nice lunch or light dinner. In a food processor place the dried bread, parmesan, 2 tablespoons oil, salt and pepper. Pulse until ground and combined. Toast the mixture in a 400 degree oven for 10 minutes, stirring frequently. Set aside. Add the 3/4 cup olive oil and heat. Add the garlic and rosemary. Cook only 1 minute or less. Do not brown. Add beans and cook on low for 7 minutes. Stir in tomatoes, vinegar and Dijon. Remove from heat. 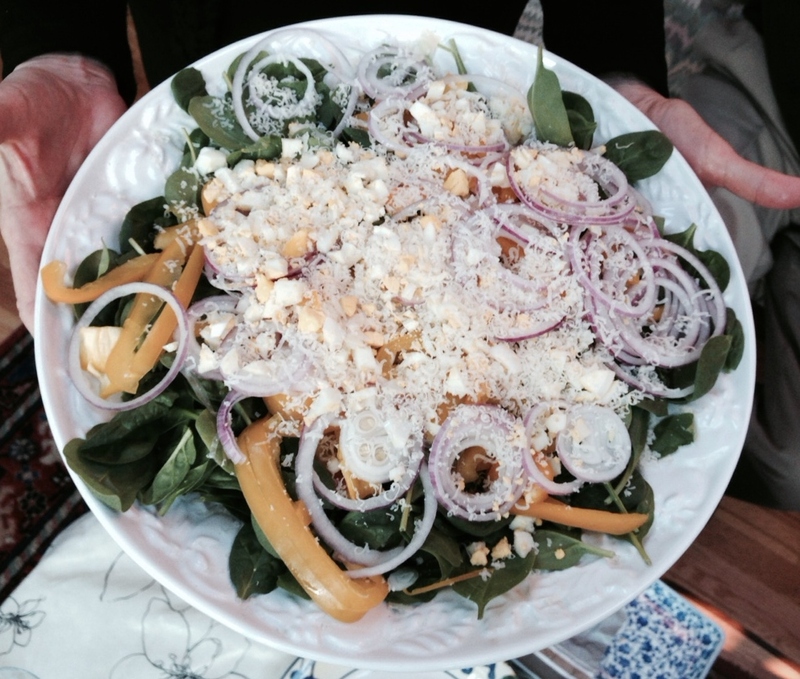 In a large salad bowl place spinach, onion and sliced pepper. Pour bean mixture over all. Add the cheese and sprinkle with salt and pepper. Shred the eggs over all and top with bread crumb mixture. Present at the table and toss slightly to serve. Posted in salads and tagged Fusion 1 Cafe, parmigiano-reggiano, spinach, vegetarian, white bean. Bookmark the permalink. Gosh! This looks wonderful! A new twist on an old favorite! I’m thinking Mercato’s Bacon infused EVOO would be a delicious choice for the olive oil. I’ll be making this one for sure at one of our After Hrs. Thanks Nina! Your Bacon infused EVOO would be perfect!!!! I’d love for you to serve this at an After Hours Party!!! !